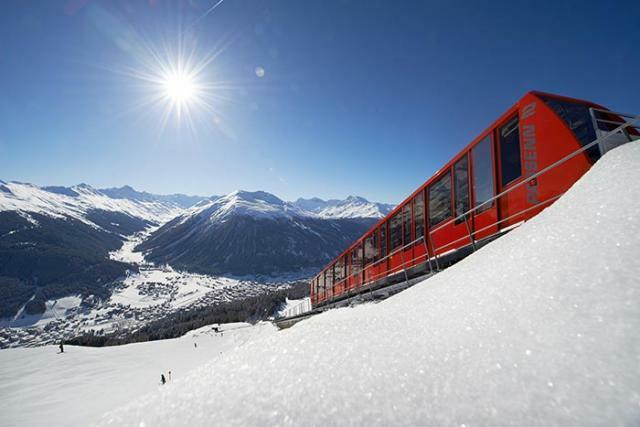 Davos Klosters – the real pioneers in winter tourism! Davos, or more precisely, Davos Klosters ski resort is one of the highest Alpine resorts in Europe, which stretches from the Rinerhorn south west of Davos to Pischa in the north east. The resort offers more than 305 km of pistes for good skiing and abundant off-piste Davos. You have a choice of five separate ski areas in Davos including the extensive Parsenn ski area which links by gondola to the Gotschna ski area at Klosters. The world-wide known city in the Alps, where it’s prestigious to have a rest – it’s all about Davos. Splendid facilities for free ride and snowboarding, and snow parks in Davos are truly regarded to be one of the best in a whole country. Today winter-sport fans from all over the world travel to six magical mountains, drawn by restaurants, sunny snowbars and 320 km of varied pistes. Davos Klosters – the place, where it all began! This year the resort is celebrating 150 years of Winter tourism. We decided to interview someone who knows the resort and its features – Nuot Lietha, Head Media of Davos Klosters Destination Organization. – Nuot, we know Davos is a prestigious resort, but what are the peculiarities of skiing there? Are you a peak performer? Then the days on the magical mountains of Davos Klosters will be over all too soon for you. Because you can choose between 6 snow sports resorts here: The Jakobshorn, the Parsenn/Gotschna resort and the three family-friendly mountains Pischa, Madrisa and Rinerhorn. Furthermore, Schatzalp/Strela offer the first decelerated skiing resort in Europe. In other words: Here, you are simply spoilt for choice – this is guaranteed by 320 km of guaranteed snow-covered pistes and 59 transport systems. Carvers and freeriders, easy skiers and speed freaks will find the ideal mountain to suit their style and with like-minded people. Parsenn is legendary, Madrisa family friendly, Schatzalp leisurely. Parsenn is regarded as the birthplace of ski sport in Switzerland. In 1895, four English tourists lost their way on the Weissfluhjoch and ended up in KÜblis. The 12-km-long Parsenn downhill run was discovered and an Alpine legend was born. It was in Davos that skiers actually skied up a slope instead of walking up it – a first in the history of Alpine winter sport. The world’s first draglift opened at the foot of the Jakobshorn at Christmas 1934. – What about the history and location of this resort, its distinctive features? The settlement of the Davos mountain region by the German-speaking Walsers under the Barons of Vaz took place in the second half of the 13th century. In 1289, the people of Davos were guaranteed their rights in a feudal letter: the rights to self-government, free election of a bailiff, jurisdiction over minor offences and no marriage restrictions as well as the right to spread over the surroundings of Davos. Davos also played a leading role in the League of the Ten Jurisdictions, an association of farming communities with no aristocratic rulers. Until 8 February 1865, Davos was known as a summer mountain health resort. On that day, Dr Friedrich Unger and Hugo Richter from Germany arrived in front of the town hall, both pinning their last hopes on the beneficial effect of the Davos Alpine air. Although rooms were available in the town hall – however unheated – both debilitated patients were taken by sleigh to the Hotel Strela, where there were four heated rooms. To the astonishment of local people, Unger and Richter immediately began a course of treatment on a bed made from a hay sled covered with boards. The treatment rapidly proved successful and both men felt able to return to work. It was not long before they were even seen skating on the Davos Lake. After his full recovery, Dr Friedrich Unger worked as a doctor in Davos for over 20 years. Hugo Richter married Magdalena Michel from Davos and took over management of the Strela Guest House, however he soon returned to his professional roots and on 1 January 1872 transferred his publishing business to Davos. From 1881, he printed the DavoserBlÄtter and DavoserWochenblatt newspapers in his printing shop in Davos. Davos Klosters is one of the most renowned holiday destinations in the world, and boasts the most comprehensive holiday, sports and meeting facilities in the mountains. The contrast between the urban Davos and the idyllic Klosters could not be more pronounced: Here Davos, the highest town in Europe, famed for the diversity of sports, leisure and cultural facilities, its rejuvenating climate, the HC Davos, the Spengler Cup, the Kirchner Museum, the World Economic Forum and the celebrated freestyle scene on the Jakobshorn. Here Klosters with its chic charm, where discreet luxury with understatement also draws royal guests. Both destinations have two things in common. : The fascinating mountain nature is delightful. You can organise your holiday days to be as rich in experiences and as rejuvenating as you wish. Because life pulsates here. Yet you can also enjoy peace here. – Are there facilities for snowboarders and free riders? A whole mountain in Davos Klosters is dedicated to freestylers’. On the Jakobshornbahn you will find a snow park, a half pipe and several mountain huts and aprÈs ski venues. Drag lifts are a necessary evil for most of the single-board snowsport addicts. Davos Klosters mountain rail & cableways have taken this to heart. Since the winter of 2011/12 all long drag lifts have been replaced by comfortable chairlifts. Jakobshorn, which has been geared towards snowboarders since the late 1980s, can thus strengthen its reputation as the snowboarders’ mountain. – What children and adults can be taught? Whether beginner or advanced, skier, snowboarder or cross-country enthusiast: the numerous snow sports schools in Davos Klosters stand ready to provide you with extensive know-how. Highly trained instructors guarantee safety, success and a great deal of fun in the snow. A relaxing drink after a day on the pistes is twice as nice on a cold winter evening. Elegant lounges, cool clubs and rock venues offer guests the best and most dazzlingly diverse nightlife in the Alps. The Bolgen Plaza has become a synonym for aprÈs ski. It’s possible to ski or snowboard right to the door of this locale at the foot of the Jakobshorn and enjoy views of the halfpipe from the large terrace. The comfortable beach chairs are the ideal place to sip a coffee laced with schnapps while watching hip youngsters practising their tricks in the pipe. And when the sun has gone down, the party continues inside the Bolgen Plaza. Fun friendships are the order of the day here – any anyone who doesn’t want to spend the evening alone is definitely in the right place. – Nuot, and what does the resort offer for families? In summer you can spend diverse holiday days with your offsprings in Davos Klosters. All that remains is to be spoilt for choice: be enchanted by the fantastic worlds of themes and experiences. The first alpine experience park «Madrisa-Land» is the home of various legends and an adventure park, and offers huge entertainment for the whole family. Kids love the Eau-lÀ-lÀ fun pool! The play creek and children's paddling pool guarantee a fantastic time. The heated lido (23° C / 73.4° F) in Klosters, situated before the breathtaking backdrop of the Silvretta range, is the perfect spot for water sports and fun with children of every age! Adventure play parks in the valley and on the mountains, petting zoos, summer toboggan run, high wire park and much more – the numerous attractions have all small hearts beating faster! The guest program «Davos Klosters Active» offers relaxation, fun and entertainment for all the family! Go in search of treasure, follow in the tracks of Goatpeter, produce your own cheese, take your favourite pony for a ride or observe wildlife in its natural setting. The program offers a range of activities every day, in all weathers and for every age. And in winter you can enjoy family-friendly winter holidays with skiing, snowboarding or tobogganing in Davos Klosters. Family holiday friendliness is actually certified here: The destination has been awarded the quality seal «families welcome» by the Swiss tourism association. The seal distinguishes holiday destinations that specifically align their offerings with the needs and requirements of children and their guardians. For a successful family holiday from A to Z. – What can the resort offer as apres-ski? AprÈs-ski fans will also find the ideal thirst quenchers at the bottom station of Parsenn. The Montana Bar with its art-nouveau interior is a great place to start a night tour through Davos. Those who prefer the valley run to Klosters should head straight for Gaudy’s GrastrÖchni, where coffee with a wide variety of shots provides a festive atmosphere. Or treat yourself to elegance and make your way to the Gotschna Bar next to the bottom station of the Gotschna aerial cableway. The bar is open until the early hours. – What type of accommodation does the resort offer? Splendid hotels in an art nouveau style from the period as a high altitude spa, as well as ultra modern seminar and sports hotels offer adequate space for all of our guests in every price class. More than 90 hotels and approx. 900 holiday houses and apartments are linked with the reservation system destination Davos Klosters and can be booked online in the holiday shop. – How long does the ski season last? And can we be sure of stable snow cover? Usually the season starts in mid-November until the middle of April. Yes, you can. Maximum snow depth in 2013/2014 was 3.66 meter. – What popular social and sports events and festivals are held at the resort? There are so many events are held, for example: Spengler Cup (Ice Hockey tournament), Art on Ice (Figure Skating show), Songbird Festival (Music Festival), Davos Nordic (FIS Cross Country World Cup), Federal Yodelling Festival, 24 hours Bike Marathon, European Junior Championships Tennis, Swissalpine Marathon, etc. – How do your guests can get there the best and the fastest way? You will travel to your holiday destination in comfort and stress-free by train. You travel by Swiss national rail (SBB) to Landquart and then continue on with the Rhaetian railway (RhB) to Klosters or Davos. Another way to get Davos is by car. Davos Klosters lies at the heart of Grisons in east Switzerland. If you are arriving by car, take the motorway in the direction of Chur and then take the Landquart exit heading for Davos. During the journey you will be put in the mood for your holiday by the fantastic mountain landscape. And if you are going to reach Switzerland by plain, with the Davos Express you can travel in comfort every Saturday during the winter season back and forth between Zurich Airport and Davos Klosters. – What’s new can be expected from lift stations and from the resort in general? One more innovation is a programme «Davos Klosters Inside». For over 100 days during the winter season local guides will provide trips to a variety of different mountains. These trips will be completely free of charge for all guests staying in ski hotels and for all guests who are staying at hotels which are also part of the program. This wonderful opportunity to enjoy the mountains and the pistes in Davos Klosters will be enhanced with special tips and advice about the best downhill skiing, wonderful restaurants and beautiful panoramic views. All the guides are either native to the area, or are experts in their knowledge and understanding of the resort. Davos Klosters Inside is open to everyone and offers both those travelling alone and those in groups a personal introduction to the very best that the Davos Klosters mountains has to offer.